If you have bad or missing teeth, you know how difficult it is to chew certain foods and smile confidently. It’s time to end the discomfort and embarrassment. Eat the foods you love and enjoy life again with safe, comfortable dental implants. A dental implant is the ultimate teeth replacement solution—it looks and functions just like real teeth. Chew normally, and never worry about false teeth again! Concerned about your smile? Call us today (or use our easy form below) for more information about Dental Implants and whether they are the right solution for you! A dental implant is a new tooth made of metal and porcelain that looks just like your natural tooth. It’s composed of two main parts. One is the titanium implant body that takes the place of the missing root, and the second is the tooth-colored crown that is cemented on top of the implant. With periodontal treatment, you can smile confidently with the certainty that no one will ever suspect you have a replacement tooth! 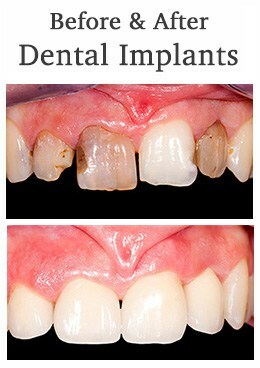 Dental implants can be used to restore one tooth, several missing teeth, or all of your teeth. One implant can support one crown, or several implants can anchor a complete or partial upper or lower denture. In addition to tooth replacement, dental implants may be used to anchor dentures, especially lower dentures that tend to shift when you talk or chew. For patients with removable partial dentures, implants can replace missing teeth so you have a more natural-looking smile. When teeth are missing, your mouth can shift and cause your face to look older. Implants are a great way to replace your missing teeth, and, if properly maintained, can last a lifetime! 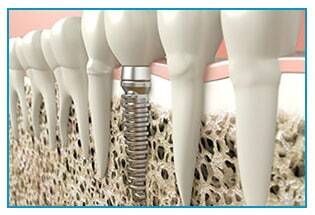 Call us today and ask us about dental implants and whether they are the right solution for you!